Specific Indications: irritation, redness, heat, tending towards dryness but with relaxation/lack of tone in the mucus membranes and venous system. There may be systemic atony and coldness with chronic inflammation. Inability to urinate or dyspepsia are also common indications. I’ve always preferred sleeping under the open sky to being cooped up indoors. Even when I was just a toddler I was so adamant about my sleeping preferences that my mother would frequently lay a blanket out on the back lawn for me to nap on. I loved the big trees swaying in the sky above and the lullaby hum of insects all about me, and I would even crawl off the blanket in order to sleep directly on the cool grass. One sunny afternoon she lay me down already asleep, and I woke from my nap to find myself face to face with lacy white flowers and soft feathery leaves brushing my skin in the breeze. In a still sleepy state, I gazed at the rounded blossoms and breathed in the pungent scent. Then upon returning to the yard, she found me with my face in the flowers and, as she tells the story, singing a quiet tune to the little plant. I was just three when I learned the name of this prolific wildflower, Yarrow. And only seven when a silver haired abuelita on my city block first showed me how to use its fresh green leaves to soothe my perpetually abraded knees and elbows. I remember being slightly incredulous at her explanation that it would help stop the bleeding and keep the scrapes from becoming infected, but I was quickly convinced after seeing its remarkable healing effects. I was so won over that I began carrying a handful of wadded up Yarrow leaves in my pocket to use every time I fell out of a tree or off my bicycle. Yarrow is my very first plant recollection and one of my first clear memories overall -- the white spray of flowers on the edge of our garden catching my attention before I could even crawl or talk. Before butterflies or toys or anyone besides my mother, I remember Yarrow. I love the taste of Yarrow, the green pungency and bitter bite combined with the feathery texture on the tongue is a unique and delectable experience. I really like the young leaves in salads and on soups. My eighteen year old daughter, Inga, has been grazing on Yarrow patches since she was just a toddler and often picks a tiny leaflet to pet her face with before dining on it. For me, just its presence is comforting and sweet, and I’m thrilled anew every time I stumble across a colony of plants. I love finding a thick, fuzzy patch of Yarrow in a mountain meadow and I’ve been known to get down on my belly to rub my face across the soft bed of leaves. Yarrow has been known by many names, but most are variations on Woundwort, Carpenter’s Weed, Bloodwort, and Sanguinary, all referring to it’s well-known and fully deserved reputation for staunching and healing the wounds of soldiers, carpenters and reckless children. Yarrow’s botanical name, Achillea, is a reference to its use on the battlefield by the famed Greek hero Achilles, who was reportedly made nearly invincible by being dipped into a vat of Yarrow tea at birth by his mother Thetis. A few of Yarrow’s other names, Devil’s Nettle, Bad Man’s Plaything and Mother-die, refer to it’s European heritage as a witch’s plant and its use as a tool of divination the world over. And here in New Mexico, it’s known simply as Plumajillo, the little feather that heals. This plant is most well known as a vulnerary, and deservingly so. It truly excels at preventing infection, promoting healing and slowing bleeding. 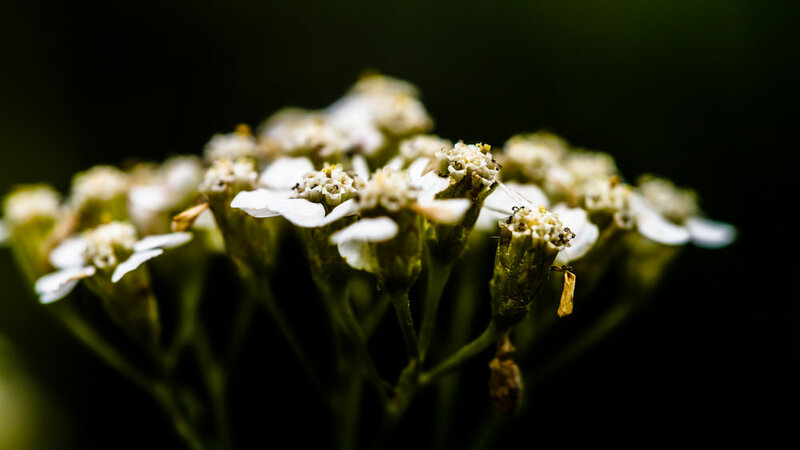 While I had used yarrow in a variety ways with good success since childhood, the first time I experienced the nearly miraculous healing qualities of Yarrow was when I cut my finger nearly to the bone with sharp jar lid. I just happened to have a handful of fresh young Yarrow leaves in my bag so I chewed a wad of them up thoroughly before spitting the poultice onto my profusely bleeding finger and tied it in place with a strip of cloth. It was a nasty jagged and very deep wound down the center of the sensitive fingertip and I expected it to have trouble with healing up without nerve damage or possible infection. I changed the poultice once that day and I was nothing short of shocked when I removed the bandage the next morning to find the wound nearly closed up without even a hint of redness and very little discomfort in the area, and certainly no nerve damage. After a few days it healed without even so much as a scar. The only other herb I have seen such remarkable wound healing results with is Larrea (it works less well as a fresh plant poultice but holds onto its healing properties much better as an oil/salve than Yarrow does). Since then I’ve used fresh Yarrow in many deep wounds and have seen the miraculous effects over and over. I don’t find it to be as effective as an infused oil or in dried plant preparations for external use, though they are certainly still worth using. I am most likely to use Yarrow on an acute injury, especially one that includes serious trauma or bleeding. It works admirably well on bruises, scratches and scrapes but it is most amazing in cases of profuse bleeding or deep cuts. It’s also wonderfully effective in the treatment of rashes and other itchy skin afflictions. I like to mix it with Artemisia and Rose for poison ivy, contact dermatitis and similar situations. If there’s heat and itching both, it’s probably best to opt for a water or alcohol based preparation rather than oil, which has the capacity to hold the heat in and potentially worsen the condition. Yarrow is a standby in many of my digestive blends because of it wide range of applications and ready availability. Its bitter taste stimulates digestion and its aromatic qualities help keep the energy moving through the gut and can significantly reduce inflammation. While not extraordinarily strong, it is gentle, dependable and broad in scope, tending towards a normalizing of digestive function rather than having a narrow line of action. This makes it useful in a wide variety of situation for many people, including children. I often include small amount of Yarrow in bitters formulas or in belly teas for those recovering from a stomach bug. It’s also great for the treatment or recovery from food poisoning or similar gut infections. Look specifically for signs of heat in the digestive system and concurrent systemic dryness. Integrating the incredible versatile nature of Yarrow, especially as it applies to the blood is essential to understanding the genius of this remedy. Look for signs circulatory congestion and accompanying heat, usually of the excess variety. High blood pressure with varicose veins, a ruddy complexion, sensitive skin, dyspepsia and joint pain (with possible gout) is a typical pattern, although there are many variations on the theme. “Yarrow should be included in any prescription for patients with venous stasis. Even if the stasis doesn't directly give rise to symptoms it will assist other circulatory remedies. This is especially noticeable when Yarrow is added to prescriptions based on heart and warming circulatory remedies which might otherwise exacerbate venous congestion. Its effectiveness is, presumably, due to its unique combination of flavonoids, coumarins and sesquiterpenes strengthening, relaxing and clearing the peripheral and venous circulation. Note that he specifically says “provided the constitution is strong” which re-states my emphasis on primarily excess conditions, as opposed to weakness and deficiency. While I have seen Yarrow be very helpful in some cases of deficiency related heat, I prefer to formulate it with gentle, nourishing herbs in these cases. I find the herb to be most helpful for robust individuals, and for those may be on the verge of passing into a more weakened state. However, it is a remarkably multi-faceted remedy and the resourceful herbalist will find many occasions not described here in which it is most useful. Besides being directly applicable to issues specifically circulatory in nature, it is also profoundly useful in other situations where circulation plays a large part, such as many liver disorders with a sensation of fullness/stuckness, pelvic congestion, profuse sweat or lack of perspiration, and any inflammation where there are signs of insistent redness and swelling. It’s especially useful in patients with an excess pattern of viral hepatitis with a tendency to digestive upset and liver congestion. Yarrow is considered an important liver herb in Europe. It increases venous blood circulation, thus decongesting the abdomen, portal vein, and liver. It also decreases capillary congestion, hence cutting down the amount of red blood over-stimulating cell life. This reduces heat. By decreasing arterial blood supply it reduces high blood sugar levels and takes stress off the liver and pancreas. In Europe, a yarrow pack or poultice is placed on the liver to cool it down. Dip a washcloth in hot yarrow tea, put it over the liver with a hot water bottle on top, and repeat daily, says German-American herbalist Julia Graves. Also related to its powerful effect on the circulatory system, Yarrow is a common and useful herb in the treatment of dry, non-productive fevers where there is flushing and great heat without an appreciable amount of sweat. It can also be useful in the seemingly opposite (Yarrow likes opposites) situation of profuse, non-productive sweating. Essentially, it is useful in nearly any diaphoretic formula and looking at many traditional fever recipes we can see that this is old (even ancient) knowledge by many cultures and peoples. Well known as a preventative and cure for colds, flus and other viruses, Yarrow is one of the plants I turn to when I first start to feel a bit under the weather. A favorite recipe of mine for preventing and treating cold and flu comes from an traditional formula: a strong tea made of equal parts Yarrow, Elderflower and Peppermint or Monarda. And taken as a bitter infusion at the first sign of illness can sometimes halt all further progression of symptoms. This is due in part to Yarrow’s ability to cool fevers, stimulate the immune system, increase circulation, clear wastes from the body, soothe aching muscles and heal mucous membranes. A strong infusion consumed after a cold or flu has taken hold will not necessarily eliminate the illness but will help break a fever, lessen symptoms and speed recovery. These same qualities also make this a wonderful remedy for childhood diseases such a measles and chickenpox. The infusion can be used externally as a wash for the accompanying skin discomfort as well. To make an infusion, simply boil one quart of water per ounce of herb (or one cup of water to one tablespoon of plant). Pour water over the herb and let steep from one hour to overnight, depending on your tolerance for Yarrow’s bitter taste. Taken as a cool tea, Yarrow is an effective and gentle diuretic. This is a common action in diaphoretic herbs and should be understood as an extension of its circulatory normalizing effects. It is helpful in many cases of heat and irritation of the kidneys and urinary tract, including incontinence and infection. Yarrow also improves tone and can help correct suppression of urine in some cases. In ancient Europe, it was said that if anyone were to hold a bunch of yarrow flowers over the eyes, they would be given the ability to see into the land of faërie. My Scandinavian cousins told me about its use in the sauna, which makes sense given its ability to encourage sweating, and its traditional use in purifying ceremonies. And ever since, I’ve found it very useful myself in the sauna. Almost three decades since I first discovered Yarrow, I’m still amazed by its power and beauty. This gentle plant is an easy one to learn from, providing us with the lessons of both resourcefulness and enchantment, allowing us to open up our awareness and notice the beauty and power of the little things we’re often surrounded by but forget to notice. And yet, its subtlety and versatility make it an ally to grow with, providing us with new insights and understandings even after we’ve been working with the plant for many years. Preparations: I prefer fresh plant preparation in almost every case when it comes to Yarrow. I will use fresh plant whenever it is available even for infusions and teas, and certainly for tinctures and salves. If dried plant is used, care should be taken that it retains its characteristic scent and vibrant color. The dried Yarrow of commerce often resembles nothing so much as straw with dingy flowers, and it rarely has any scent or taste beyond a slight bitterness. This stuff is essentially useless, avoid it at all costs. The tincture seems very stable and lasts for at least several years; it should taste VERY like the fresh plant, the bitter taste hitting the tongue first and then the aromatic properties slowly beginning to predominate. This is one of those herbs that you need to taste in most cases for it to work most effectively. The infused oil is less stable in my experience and I try to use it up within a year. Dosage: A broad range, from a few drops of tincture to a dropperful. Same applies to the tea/infusion. Yarrow baths or sitz baths are a great way to (literally) soak up the medicine and energy of the plant. Harvesting: I use young leaves and flowers for the most part and the young leaves can be gathered year round from first year basal rosettes. When harvesting the flowers, I clip the top half of the flower stem and use the leaves and flower heads. Roots can be gathered from second year or older plants. Medicinal strength will vary a great deal from plant to plant and habitat to habitat. Seaside NW varieties seem especially strong and waterlogged plants growing in rich soil seem less so. In the SW, look for plants growing in rocky soil in partial shade, they often seem to be stronger. Cautions & Contradictions: Caution (that would be moderate dosage and common sense) should be used during the early stages of pregnancy. NW herbalist Ryan Drum says that care should be taken with long term chronic (multiple cups of strong tea per day for more than a month at a time) use of Yarrow because of possible negative effects on the liver. I have not personally seen this, but nor have I ever managed to ingest this much Yarrow in such a short time period. A perfectly safe herb for nearly anyone in moderation. Additionally, there is the possibility of reaction in those sensitive or allergic to the aster family.